January, 2017, Tornado Outbreak Second Largest on Record in Southeast U.S.
Home » Weather » Thunderstorms » January 21-23rd Tornado Outbreak Second Largest on Record in Southeast U.S.
January 21-23rd Tornado Outbreak Second Largest on Record in Southeast U.S.
On January 21-23rd, 2017, a rare, multifaceted severe weather outbreak occurred across the Deep South and southeastern United States. 80 tornadoes occurred over the three day span of the outbreak, of which several were strong (EF-2 to EF-3 strength), long-track tornadoes. This tornado outbreak was the second largest outbreak on record in the southeastern United States. Elevated risks for severe thunderstorms were accurately forecasted across the southern U.S. by meteorologists in the government, private, and broadcast sectors alike. On Sunday, January 22nd, the NOAA Storm Prediction Center issued a High Risk convective outlook for tornadoes. This was the first High Risk convective outlook issued by the SPC since June 3rd, 2014. Forecasts several days in advance of the multi-day severe weather outbreak suggested the potential for widespread severe thunderstorms across the Deep South and southeastern United States, including the potential for tornadoes, damaging winds, and large hail. Prior to the event, a mid-level disturbance moved through the southern Great Plains and began to strengthen as it moved over the lower Mississippi River Valley by Saturday, January 21st. 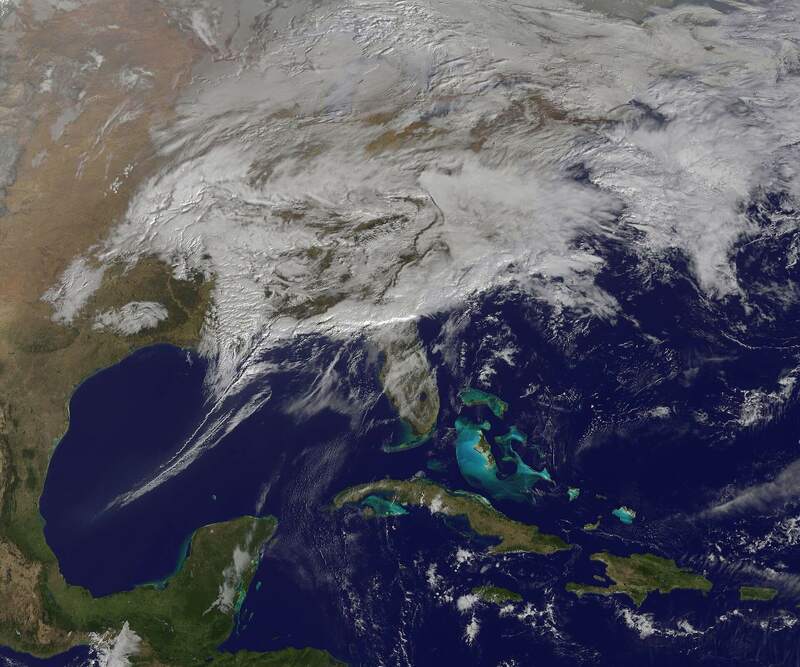 As cyclogenesis occurred over the eastern Great Plains and into the Deep South, the severe weather threat began to increase across the region. Above are two upper air charts that sampled the atmospheric profiles at 500mb (mid-level) and 850mb (low-level), respectively. A steep trough was pivoting its way into the southeastern Great Plains and the Deep South at the time with sufficient, poleward flow out of the south in the low-levels of the atmosphere. In addition to deep vertical wind shear, sufficient thermal instability, or CAPE; Convective Available Potential Energy, near 1,000 J/kg was in place as well. The combination of strong dynamics and adequate thermodynamic profiles are some the key ingredients for the genesis of severe convective storms, including tornadoes. 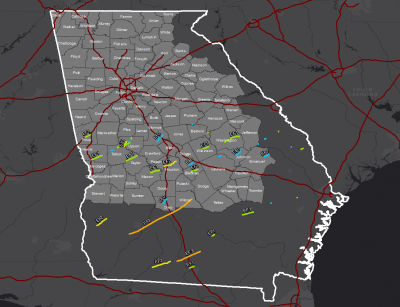 A record number of 41 tornadoes occurred across the state of Georgia throughout the outbreak. 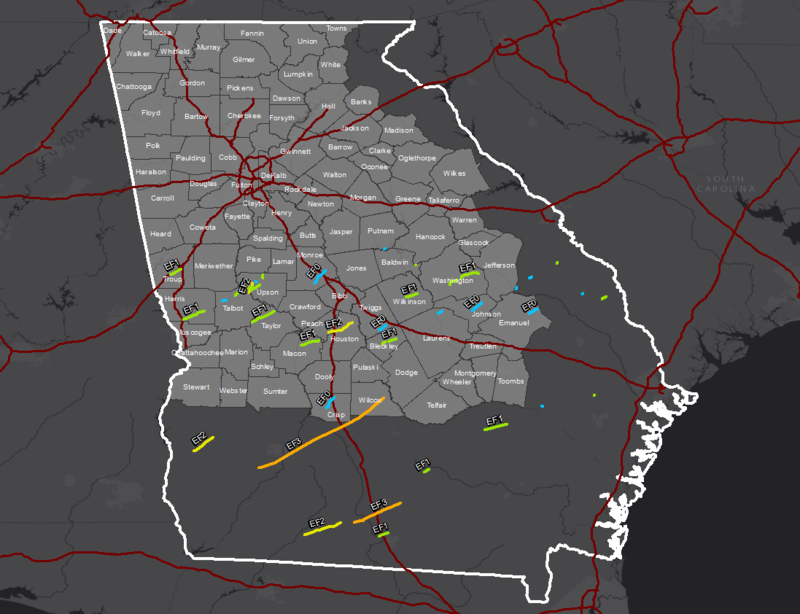 Many of these tornadoes in Georgia were also long-track tornadoes, with one tornado that had a surveyed path of 70.73 miles. 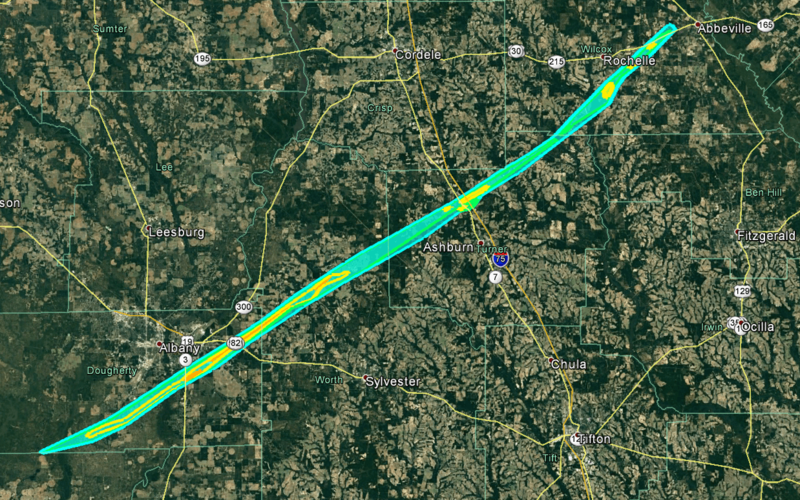 This long-track tornado in particular impacted the town of Albany, Georgia, head on with estimated maximum winds of 150mph, earning it a rating of an EF-3. Other long-track tornadoes occurred across the southeastern U.S. in other states as well. Below is a table of all of the long-track tornadoes that occurred during this multi-day event, using a threshold of ≥15 miles and sorted from longest-to-shortest tornado track length. In addition to the tornadoes, widespread damaging winds and extremely large hail events were observed, and/or reported by the public. The highest thunderstorm wind gust (not produced by a tornado) was measured at the Birmingham International Airport in Birmingham, Alabama, with a speed of 75mph. The largest hailstones observed throughout the tenure of the event were 3.5 inches in diameter near Jonesville, Louisiana. The table below is a list of severe hail reports using a threshold for hailstones ≥2.0″ in diameter and damaging wind reports ≥60mph. Throughout the tenure of the tornado outbreak, 20 tornado fatalities occurred — more than the total number of tornado fatalities in the year of 2016 combined. Two additional fatalities occurred during this event, but were non-tornado related casualties. 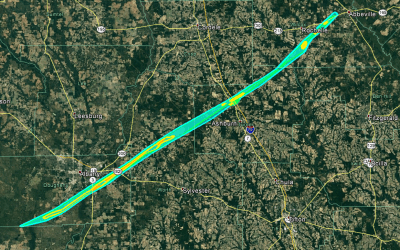 The long-track tornado that impacted Albany, Georgia, claimed four lives and injured nearly 40 people in its wake. 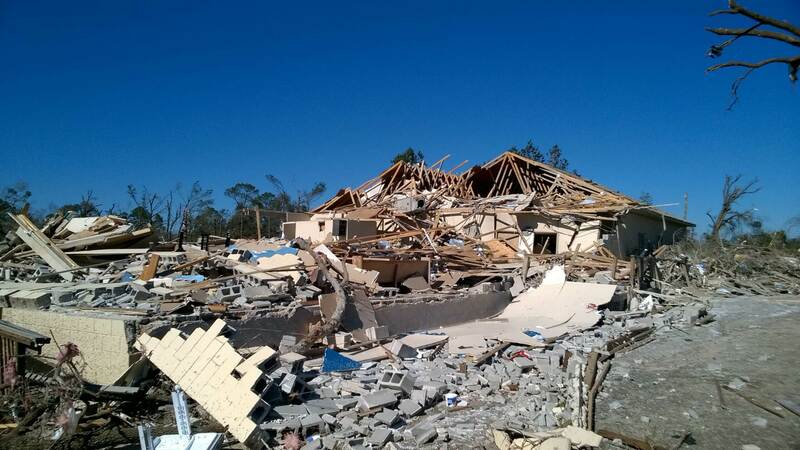 EF-3 damage to a well constructed church in Albany, Georgia. Image credit: David Roueche, Ph.D., University of Florida’s Wind Hazard Damage Assessment Group, and is of public domain use. Damage estimates from the tornado outbreak estimated near $600 million USD. 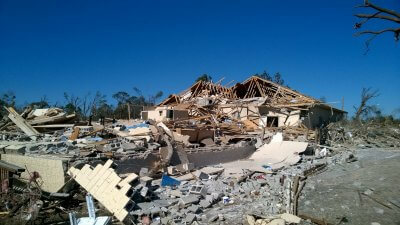 This tornado outbreak was the second deadliest outbreak recorded in January for the southeast U.S. The number of tornadoes that occurred during this outbreak increased the total number of tornadoes for the month of January, such that it was the second most active January in the U.S. in recorded history with 128 total tornadoes.